The hard edges scraped against the tin roof, squealing like fingernails on a chalkboard. Not the newer boards found in today’s classrooms. What a progression there. You could trace it backwards. SmartBoards replaced whiteboards replaced green boards of luan. You had to go back a long way to get to real slate. Heavy, but good for drawing on. And for truly driving your teacher crazy if you skipped cutting your fingernails one week. Rain, fat drops of it, splattered against the window and she swore again. She’d closed all the windows at the first sign of darkness on the horizon, but got up to check them again. Each was tightly shut and latched. ‘Course that didn’t mean the curtains didn’t make little dances in the breeze that squeezed its way through the cracks. A flash of light startled her, but her mind counted automatically. “One alligator, two alligator…” She made it to seven before the roll of thunder reached her. There was time. She wasn’t alone. Barnaby was around somewhere. Probably hiding under the big bed upstairs. Scaredy-cat. Literally. But George wasn’t home and she paced, worried he might’ve left the store early, trying to get home before the bad weather struck. Her hand hovered over the phone, tempted to call and tell him to stay put. But that would let him know she was worried. Scared to stay in the house during a thunderstorm and she didn’t want to hear his gentle teasing. She was an adult. No need to be worried over things that she couldn’t control. Another flash, another screech across the tin roof, another jump of her nerves. Definitely time to take that tree down. The Stone Mountains have existed in my imagination for decades. They are a central location of The Companion, an as-yet-unpublished fantasy story and, the moment I first saw this painting of Steven’s, it was as if he’d gone inside my head and pulled the picture from my imagination. The story’s two protagonists, Martin and Kiera, both have heard fables about the dangers of going up into the mountains. These two excerpts from the novel describe their concerns about this mysterious mountain range. A small fence separated the garden from the rest of the farmyard, the gate currently open and inviting. Kiera couldn’t resist stepping onto the garden’s teeming earth, feeling the tendrils of power curl around her bare feet. She lifted the hem of her robe and dug her toes in deep. Kiera turned to see Ham the younger hanging over the top of the fence, the pail of water he’d been sent to get sitting beside him, only half full. The path to the well showed where the rest of the water had gone to…a trail of wet splotches led right to Ham’s feet. “Earth Mothers don’t go up into the mountains, Ham. ‘An Earth Mother who crosses the Mountain’s Foot is lost forever,’” Kiera quoted. How she’d hated those lessons with Mother Abbess. Until being accepted by the One and sent to study at Earthhome, Kiera really hadn’t given geography much thought. All right, so she sometimes had wondered what lay beyond her own town’s flat fields and small woods, but really, curiosity had never been her curse. Martin had heard the legends about the Stone Mountains, of course. Every first year Candidate knew the warnings by heart, though Martin discounted the stories of ghosts and haunting screams, knowing those were just tales to frighten children. He was more concerned with the tales that spoke of Sky Fathers who had made the attempt to cross and who had gone mad. Upon their return, they gibbered of a “great emptiness” and “wasteland like no other.” Their insanity, however, made it difficult to understand. The few who came back died not long after their return. Martin, however, was fully Renewed and determined to discover what lay on the other side. The tales had been full of stories on that account, too, filled with wild savages and unholy beasts who roamed the far side of the mountains. Taking his horse by the reins, Martin turned toward the road leading upwards. Path, really. The old Stone Road that started at the western shore and wound its way through Renthom theoretically continued up and over the Stone Mountains and down into the land on the other side. Years of neglect, however, had narrowed it considerably after it left Anre’s farm. What lay before him now would permit two men walking side-by-side in comfort, three at a squeeze. Too steep to ride a horse, however. Squaring his shoulders for what might lay ahead, he stepped up the path -- and stopped dead. Painting-Inspired Writing - or is that Writing Inspired Painting? The Franklin Street Gallery, located in Watkins Glen, NY (yes, they have more than NASCAR racing there!) is an art gallery that promotes local artists. My husband has shown pieces there several times. For their spring show, however, they're doing something a little different: each painting needs to be accompanied by a story or poem inspired by the painting. What a cool idea! My painter husband, of course, turned to his writer wife and and said, "So, have any of my paintings inspired you?" Please understand, he primarily paints landscapes, I write mostly character-driven stories. The two subject matters are very different. So I had to answer no, with a caveat. 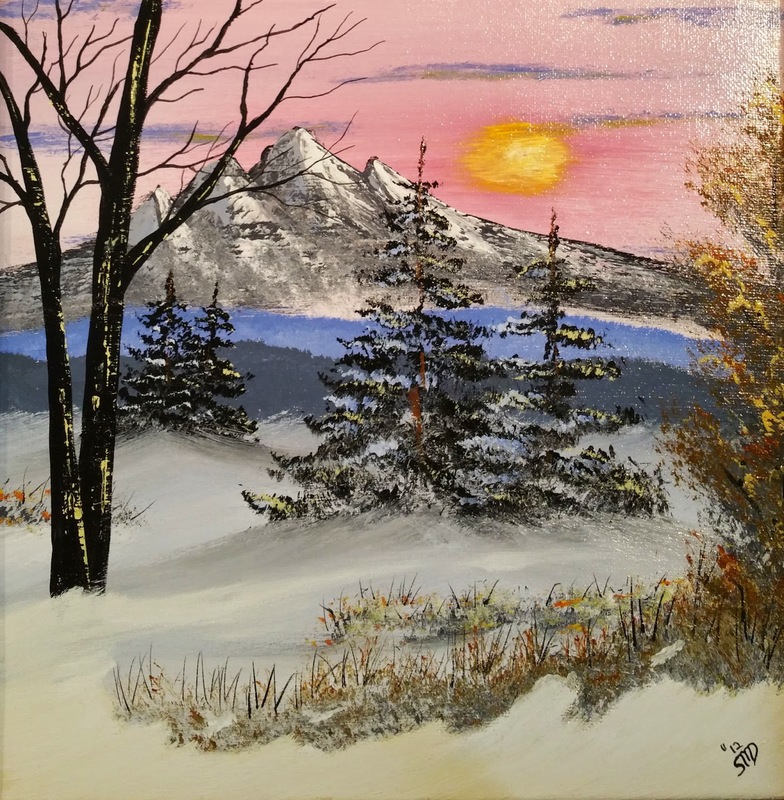 Early on in his painting career, he painted a small picture (12x12 Acrylic on Canvas) of small mountain range in winter. I took one look at it and told him he couldn't sell it. It was going in my study. Why? For several decades now I've been working on a fantasy. Without going into too much detail, there is a mountain range that extends the width of the border between two countries. Nothing grows there and no one who ventures along the Stone Road into the mountains ever returns. From either side. As a result, these mountains serve as a very definitive divider to keep the two peoples apart. My husband had painted the Stone Mountains. I brought down the painting to show him and he sighed. It was an early painting and he's a better painter than that now. I don't see anything wrong with the painting as it is, but then again, I'm no art critic. I just know what I like. And I like this painting. Another problem arose as we talked about it. 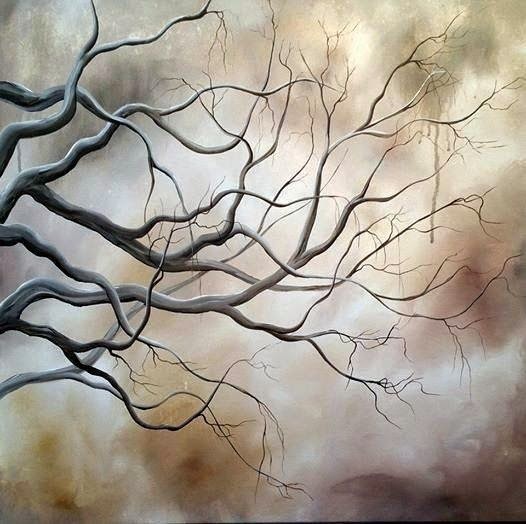 All paintings shown in the gallery have to be available for sale, and I want to keep this one. Solution? He'd paint another painting of the same set of mountains and put that one in the show so I could keep the one that spoke to me. Is it any wonder I love him? He can submit three paintings and their accompanying written piece to this show. "Stone Mountains" will be one of them. The second one is a painting my daughter wrote to. The third? I chose a painting of his and used it to inspire a short scene of a brand-new piece. His painting is entitled "Empty Arms." Almost two years ago I wrote a writing workshop on using paintings as inspiration, and here I am, putting my workshop into practice. Whether we're talking photos (See the stories inspired by James McAvoy and Chris Pratt), or paintings, other media can inspire some fun writing. I'll post the paintings and their companion writings in a separate post. Watch for them coming soon. And, if you're in Watkins Glen, stop in at the Franklin Street Gallery on the main drag. The opening reception is this Friday night and the show runs for a few weeks. Preface: I teach Freshman Composition at Finger Lakes Community College. The first term paper the students do is a reflection on an issue. In the course of our discussion on Tuesday, I mentioned my dyslexia and the resulting coping strategies I've developed over the years. One of my students asked if I had ever written about my experiences and I realized, I never had. Not sure why I haven't, but she got me to thinking and I decided to do the assignment right along with them. So here is my essay, On Being Dyslexic. Enjoy! I’ve always had trouble with phone numbers. People would tell me their number, I’d write it down, and invariably, get it wrong. Repeating the number back to them until I’d memorized it seemed a safer venture, but mostly, all I got out of this was a fear of dialing numbers. Seriously. I hate making phone calls. Even in this age of digital everything, if I have to key in a number, I have tremendous anxiety issues. Will I get the person I actually meant to dial? Have I keyed the number correctly? What if it’s a wrong number? I have to psych myself up just to dial the phone. Today we’d call it a “learning disability” but back then (the 60’s and 70’s), you were just quirky. And no one caught on. Why? Because spelling was easy – I had no trouble with letters except for words that contained both a “b” and a “p”. If I had to write the words “but put” in the same sentence, invariably I got them wrong the first time and had to erase or cross out and rewrite them. Which I did, so no one noticed a problem. In math, it was only 9’s and 6’s that gave my any trouble and again, I could usually spot the mistake quickly and fix it before it got to being graded by the teacher. There was one trait, however, that often frustrated me: I’d say “spring” when I meant “fall” or “winter” when I meant “summer.” For some odd reason, I’d say “purple” when it was clearly “orange”. “Hot/cold”, “up/down” and “right/left” were other mix-ups that made no sense to me. I clearly could see that fruit was orange, so why would the word “purple” come out of my mouth? My parents would always just look at me funny and correct me. It seemed to be a problem to no one but me, so I just accepted it as part of my nature and moved on. Until I saw a TV program about a boy who told the cops he was 81, when he was 18. He often got opposites mixed up and couldn’t read or write well. The actor who played the role was Kurt Russell and I was madly in love with him (still am! ), which is probably why we were watching the show in the first place. The Storefront Lawyers ran only a single season and played opposite The Courtship of Eddie’s Father, which we watched all the time. Anyway, in that episode, Russell plays Jerry, a kid the cops think is being disrespectful. The lawyers realize he’s dyslexic. I’d never heard the word before. But the character of Jerry and the resultant description of dyslexia fit me perfectly. I wasn’t quirky – I was dyslexic! It wasn’t just me, this switching of words and having troubles with certain letters. Not that it changed much. Special Education at that time didn’t exist in the way it does now. No one diagnosed me and life continued much as it had. The only difference was my own attitude about myself. I wasn’t alone. There were others like me. There was no “cure” but I could adapt. That last part I figured out on my own. By the time I got to college in the late 70’s, a great deal of work had been done on learning disabilities, dyslexia among them. Since my degree included certification in English (Theatre Major, Education minor), several of these disabilities were discussed in class – from the viewpoint of a teacher trying to teach material to students who have them. Listening and learning, I applied the coping strategies we were given to teach our students to my own situation. Later, as a teacher, I recognized my own dyslexia was mild. I mix up a few words and hate phone numbers. When typing, I have a few words that will always come out wrong (“studnets” instead of “students” is my particular burden to bear), but I have had kids in my classroom who cannot read at all because the letters dance about on the page for them. They look once and the letters are in one order, they look again, the letters are now arranged differently in the word. Those are the kids I feel the most for and it puts my own quirkiness into perspective. I never felt I had a disability, only a difficulty. While I was thrilled beyond measure to discover I wasn’t alone, I obviously didn’t need resource time or any test modifications. I used my coping strategies (a term I picked up in my first years of teaching, by the way) and got on with life. And it was that attitude I tried to impart to my students. Just accept it and move on. Having a learning problem doesn’t mean you’re a failure, it just means you have to find the way around or through it. For me, that meant going public. I mixed up letters on the board on occasion and rather than get flustered by it, I confessed my slight dyslexia to my students (all of whom knew what that meant by the 80’s). I told them they were my coping strategy. I counted on them to point out a mistake like that so I could correct it. I also tried to impart to them that a learning disability shouldn’t hold them back. I have dyslexia. I’m also a writer. I’m an English teacher, a blogger and a writer of essays. I like words. My vocabulary is extensive because I read as much as I can as often as I can. I drive my husband and kids crazy because I still grab the opposite word from the one I want but it’s okay. They’ve learned to just translate in their heads. My future daughters-in-law are learning the same thing. Several years ago, a counselor confronted me and told me to stop telling my students I was dyslexic when I clearly wasn’t. I was a teacher, for crying out loud. Teachers didn’t have learning disabilities. She asked me who made my diagnosis. I couldn’t very well say, “A TV series”, so I brushed off her question. I wish I could remember the rest of the conversation so I could tell you I took her to task for her biased statements, but I probably didn’t. I was still a young teacher then and a little afraid of those in power. The incident, however, made me realize all the more how important it was for kids to see a person who had become successful despite having a learning disability. In her attempt to get me to stop, that counselor did all my students a favor – I became even more of a champion of their successes. So don’t ask me to make phone calls, and if you hear me grab the opposite word from the one that makes sense, don’t panic. Correct me in your head or correct me out loud, it doesn’t matter. I know my dyslexia and I’m fine with it. I need to preface this post by saying stories about vampires have never really been my “thing”. Dracula was okay, but Frankenstein was better. I read the Twilight series only because my daughter wanted to be able to talk about it and my neighbor loves it. I don’t even watch vampire movies. Just never got into them. For the past two or three Christmases, I’ve asked my family for the same thing: get me a book you think I’d like to read. Doesn’t matter if they’ve read it or only read reviews, or got recommendations off my Amazon wish list, just put a little thought into what I like and find me a good book. This December, my husband went reading the bestseller’s lists and found a fantasy series that made several of them. He bought me all three in the series and I was thrilled he spent the time finding something I’d like. The only thing is, he didn’t know about my lack of enthusiasm for vampires (and no, I never even read Interview with a Vampire – and didn’t see the movie until only a few years ago). He bought me the All Soul’s Trilogy by Deborah Harkness. The three books: A Discovery of Witches, Shadow of Night and The Book of Life, were well-written, if a little pedantic. The author is a history professor by day and she occasionally falls into the historical fiction trap: knowing so much about a time period that you can’t help but throw in more information than is really necessary, just because you found it interesting. Anyway, the book deals with witches and vampires and I read all three books because I did like the plot line, even if I was about ready to throttle the male protagonist by the middle of the second book. The author kept letting him grow...then yanking him back to a more animal-like state over and over. A setback or two I can understand, but there were far too many times he ran away from the female protagonist because he was afraid he was going to hurt her. It got redundant. And predictable. But, as I said, I’m not a fan of the genre, so maybe this is par for the course. If you like vampires and witches, these books may be right for you. For me, they were just okay. Not keepers. I read a couple of other books in January and will record those here soon.